The first Cockermouth workhouse was built in about 1746 on Skinner Street, on the bank of the Tom Rudd Beck. It was known as "Three Briggs Hall" from the three bridges nearby. A parliamentary report of 1777 recorded that the Cockermouth workhouse had accommodation for four inmates. The building survived until the early 1970s. In 1829, White's Directory recorded that "Mr Robert Bell is governor of the [Cockermouth] Workhouse which stands in Kirkgate." The Poor of this parish are chiefly supported in a large and commodious Workhouse, which can take 150 persons. It is placed a little out of the town in an open, healthy situation, and was opened on the 28th October, 1793. The effect on the rates has been a saving of over £252 yearly. Every possible attention is paid to the Poor, and such as have need of parochial assistance are comfortably and amply provided for, but a Workhouse, with all its comforts, is not attractive, and perhaps this is the principal cause of its being highly beneficial. An 1829 directory described the Workington workhouse as "a large commodious structure which was built about 40 years ago, at a cost of £1600. It stands half a mile westward from the town, and will accommodate upwards of 150 paupers, but seldom contains more than 70 or 80, who are maintained at the average cost of 1s. 9½d. per head weekly." Also in 1829, Nelson's lane in Maryport was the location of the "large and commodious" workhouse for the paupers of the Cross Canonby parish. Cumberland: Barrowdale, Bassenthwaite, Bewaldeth and Snittlegath, Blindbothel, Blindcrake and Redmain, Bothel and Thrupland, Brackenthwaite, Bridekirk, Brigham, Great Broughton, Little Broughton, Buttermere, Camerton, Castlerigg St John's and Wythburn [Withyburn], Great Clifton, Little Clifton, Cockermouth (4), Coldale or Portinscales including Newlands, Dean, Dearham, Dovenby, Eaglesfield, Ellenborough and Unerigg, Embleton, Flimby, Gilcrux, Greysouthern, Isell Old Park, Keswick (2), Lorton, Loweswater, Maryport Kirkby Cross (4), Mosser, Oughterside and Allonby, Papcastle, Plumbland, Ribton, Seaton, Setmurthy, Stainburn, Sunderland, Tallantire, Underskiddaw, Whinfell, Winscales, Workington (5), Wythop. Later Additions: Derwent, Cloffocks (from 1858), Crosscanonby, Ellenborough and Ewanrigg, Skiddaw (from 1862). The population falling within the Union at the 1831 census had been 31,835 with parishes ranging in size from Ribton (population 26) to Workington (6,415) and Cockermouth itself (4,536). The average annual poor-rate expenditure for the period 1836-38 had been £7,434 or 4s.8d. per head. In 1840-3 the Union erected a new workhouse on a site to the south of the Cockermouth between Gallowbarrow and Sullart Street, with the first part opening in June 1841. Its original cost was £4,000 but an additional £500 was spent on improvements, with an additional east wing and fever hospital being added in 1847 at a cost of £600. The main building had a very similar plan to the nearby Penrith and Wigton workhouses; all are broadly based on Sampson Kempthorne's "200-pauper" model plan published by the Poor Law Commissioners in 1836. The workhouse location and layout can be seen on the 1923 map below, by which time it had become known as Cockermouth Poor Law Institution. The building consisted of a two-storey main block connected at its centre to a cruciform main building at the rear which backed onto the railway . The workhouse closed in August 1935 and was used by the Royal Army Service Corps during the Second World War. The buildings were demolished in the late summer of 1949. The former Workington parish workhouse continued to be used for the accommodation of the town's poor until 1853. 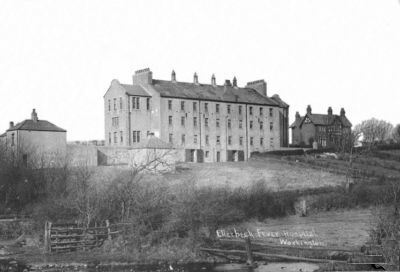 In 1888, the building, on what is now Ellerbeck Lane, was acquired by Workington Board of Health and converted into a fever hospital. An administrative building was subsequently added to the north of the hospital. Ellerbeck Hospital former administration building, 2000. The hospital later became part of Workington Infirmary but closed on 6th December 1965. The hospital has since been demolished and the site redeveloped. The administration building survives as a private house. 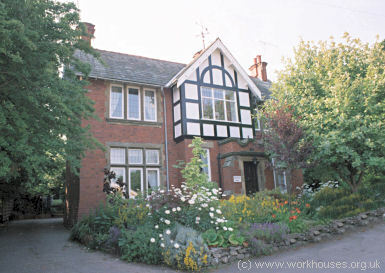 In addition to the workhouse, the Cockermouth Union opened workhouse schools for 80 children at Flimby in 1887. Flimby Lodge, formerly a ladies' school, was purchased in 1886 for conversion to a school and vagrant wards. In 1914 there were 31 boys and 14 girls in residence. 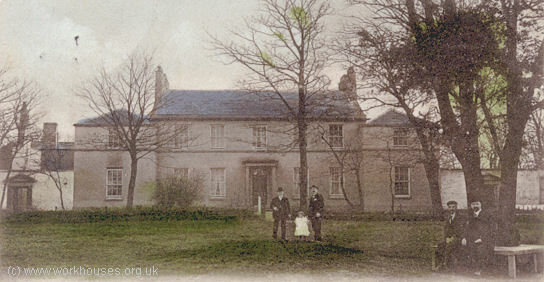 From 1915-31, the union had a children's home known as Park House at 34 North Street, Maryport. In 1891, the union erected additional vagrant wards at Keswick. 1914 — Master of Vagrant Wards: Isaac Irving; Matron: Mrs Sarah Irving; Schoolmaster: Robert W Adamson; Schoolmistress: Mrs Sarah Yates; Medical Officer: Robert Lindsay Clark. General holdings include: Guardians' minutes (1838-1929); Accounts (1839-1930); Committee minutes (1877-1930); etc. Workhouse holdings include: Births and deaths (1842-1933); Admissions and discharges (1902-27); Creed register (1904-33); Punishment book (1864-1917); etc. Flimby Lodge holdings include: Register of children (1887-1922); Admissions and discharges (1907-33); Superintendent's report book (1914-16); Report books (1926-1933). Park House children's home registers and report books (1915-1931).